"One of the stories was that there was a regular meeting of a communist cell in Wayland. The evidence was that every Thursday night the same group of cars convened at the same house. The gentlemen who reported it took down the plate numbers and reported them to the FBI. The truth of the matter was that this was a ladies' bridge club. . . "
". . . we too [Mr. and Mrs. Stokey] were reported. Our sin was that we had taken our shutters off our house to paint the house and had not put them back on. This was viewed as highly suspicious because Ned Goodell who lived near us had done the same thing. He was generally believed to have been a member of a former member of the Communist party. So if we took our shutters off, that must be signal. . . "
"I do solemnly swear that I will uphold the Constitution of the United States and of the Commonwealth of Massachusetts, and that I will oppose the overthrow of the government of the United States of America or this Commonwealth by force or violence or by any illegal or unconstitutional method." This is the key to Miss Anne Hale's history in Wayland, the story of a former communist dismissed from her job as a second grade public school teacher. 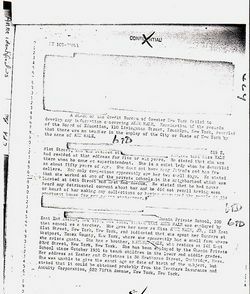 Known to the FBI as a rather benign member of the Communist Party, Miss Hale nevertheless lost her job due to her political affiliation. Her files describe her as a quiet lady without many friends who'd spend most of her time with her pet dogs and, on occasion, "a colored lady who appeared to be advanced educationally. . .whom she believed to be a doctor or a teacher." Very suspicious. I should like to repeat what I have already said I have not been a member of the Communist Party since the end of 1950 nor have I been active in its behalf since that time. The Communist Party was a political organization dedicated by lawful means through majority action to establish Socialism in this country. I have never advocated, nor heard any one else connected with the Communist Party at any time advocate sabotage, espionage, sedition or the violent overthrow of the government. When I came to Wayland to teach in 1948, I considered carefully the meaning of the teachers oath. I could certainly say with perfect truth that I would do my best to uphold the Federal and State Constitutions. That I wished to see them amended was not contrary to such an oath. The constitutions themselves contain provisions for amendment, of course. My father was a delegate to the Massachusetts Constitutional Convention that was held about 1910. She claimed that she was unaware of the act that declared it illegal for the Commonwealth to hire a member of a subversive organization. 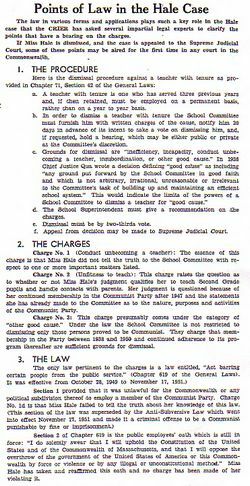 (Conduct unbecoming a teacher): The essence of this charge is that Miss Hale did not tell the truth to the School Committee with respect to one or more important matters listed. (Unfitness to teach): This charge raises the question as to whether or not Miss Hale's judgment qualifies her to teach Second Grade pupils and handle contacts with parents. Her judgment is questioned because of her continued membership in the Communist Party after 1947 and the statements she has already made to the Committee as to the nature, purposes, and activities of the Communist Party. This charge presumably comes under the category of other good cause. 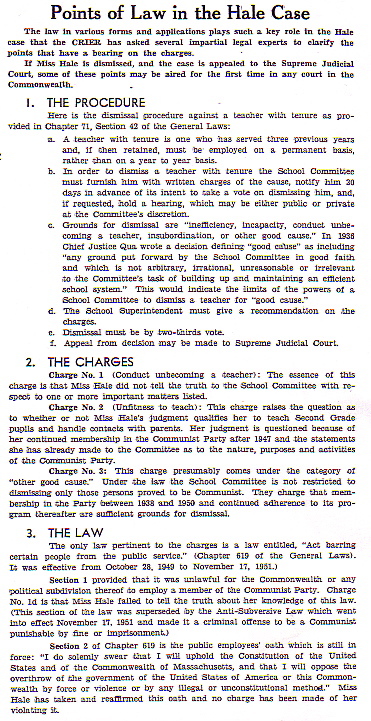 Under the law the School Committee is not restricted to dismissing only those persons proved to be Communist. They charge that membership in the Party between 1938 and 1950 and continued adherence to its program thereafter are sufficient grounds for dismissal. Not willing to let the matter be settled in secrecy, she requested a public trial. She wanted to show that her idea for a better world had no influence on her teaching. To dispel any mystery about the charges against her she published numerous letters in the Wayland Town Crier. These included a letter to her students, the history of her communist period, and reiterations of her statements from April 23rd. My Father, when I asked him to define a successful person, gave his definition as one who had helped the broadest group of people to the utmost of his ability. This has been my goal for success in life ever since. She speaks of her frustration with a private school where she taught and her inability to contribute to anything positive. She speaks of being impressed with the sincerity of the Communists and her apprehension with joining them because of the notion that they advocated violence. For a long time I held back, because I was told by others that they believed in force and violence. After some study and investigation of this I found that they taught that socialism could come only when the majority were ready for it, and chose a socialist government. Their other objectives being the same as mine: to improve conditions for the underprivileged, by basic changes when the time came, but until then by working for jobs, peace, democracy, better housing, better schools, and so forth, I felt there was no further reason for hesitation, and I joined the Communist Party in June, 1938. 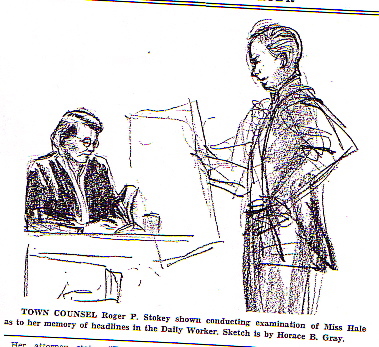 Roger Stokey, as the Town Counsel, had the unpleasant task of prosecuting Miss Hale. 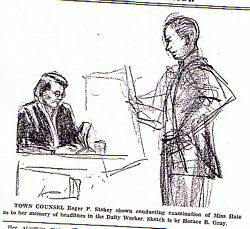 Stokey did not refuse the job knowing the trial could potentially be handled very badly, and knowing he would do his best to conduct the case fairly. The political climate had made this a very delicate operation. The McCarthy-Army show trials coincided with the hearings and could be seen by anyone with a TV. 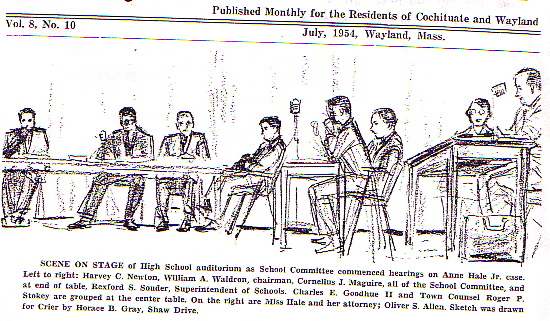 (The trials were joked about on the first night of the hearing; called Wayland's "competition in Washington" by the Crier.) This was not the peak in McCarthy's popularity; it was actually the beginning of his rapid downfall. It did however play on the curiosity of the citizens. It was that curiosity that, on the first night, packed 700 spectators into the High School gym (now the Town Building). What they witnessed, however, was the exact opposite of the reckless brutalizing of a witness from a demagogue foaming at the mouth. Hale supporters would commend Stokey for, as Mr. Waldron, a member of the School Committee who voted against dismissal,stated "Proceeding carefully, conscientiously, and intelligently." The hearing included a short list of witnesses called to the stand, among them teachers from the school and an FBI agent. 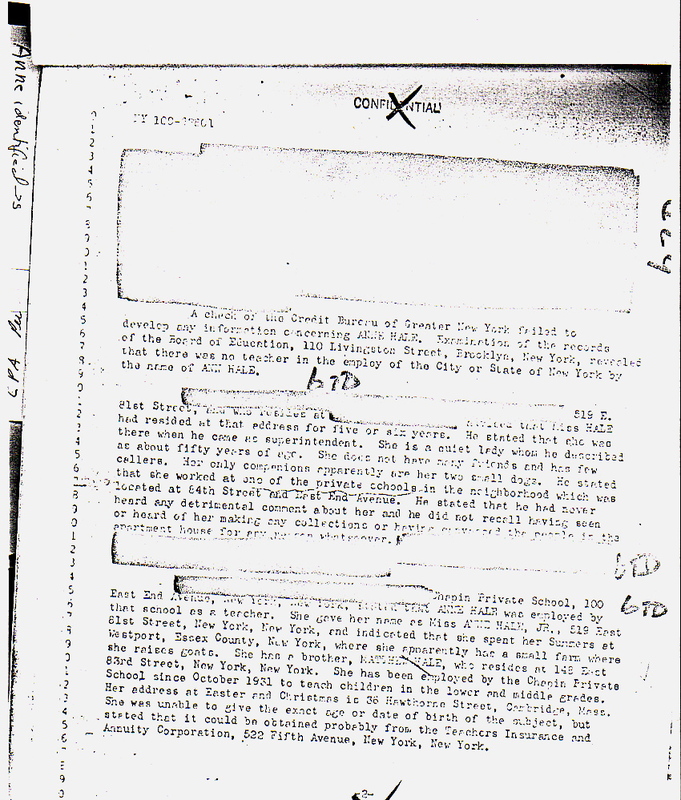 Mrs. Edith Stokey says the hearings were intentionally dulled down to curb public interest. By the third hearing attendance had tapered significantly. She believes this is a private matter and when asked under compulsion she is not obligated to answer. She had answered the committee questions previously because she wanted it understood that she held unpopular views and felt she had a right to hold them. She admits the right of the school committee to question her on matters pertaining to any proof they might offer that she was not sufficiently prepared to teach or that she lacked perception and judgment in dealing with children or parents. The constitutions of the United Sates and Commonwealth forbid such inquiry as does Chapter 71, Section 29 of the General Law. The Committee, apparently taken by surprise by this development, recesses." On going to Wayland, Massachusetts, in 1950, I was only 25 years old, and I did not have the wisdom of years that Arthur had earned. 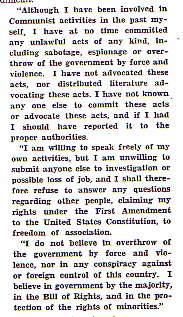 Soon, at the high point of the "red scare" of Senator Joseph McCarthy, I was in trouble for openly speaking my mind. Several in the congregation were incensed over my sermons, and demanded that the Standing Committee fire me. Fortunately, the congregational vote retained me, and a goodly number of previously uncommitted liberals in the community, on seeing the congregation support me, decided to join the church and give added support. It was then that the F.B.I. started to build its file on me. 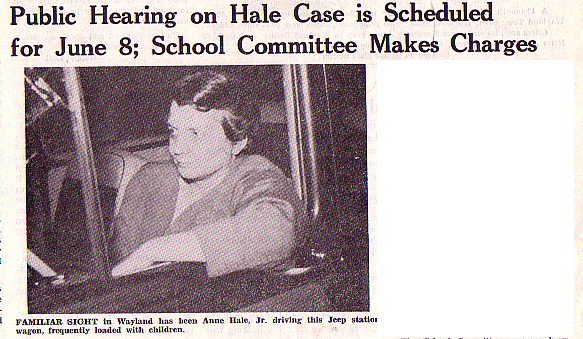 I supported Anne Hale, a member of my congregation, a popular, well-loved school teacher, who was being hounded and finally fired by the school board for having once been a communist, and who refused to beg for pardon. It hit the front page of the Boston newspapers, and we received hate mail and terrible telephone calls. But my great congregation stood firm. Stokey wants her to state her grounds [for refusing to answer]. Mr. Allen [her lawyer] asserts she is not legally qualified to answer such a technical question, Mr. Stokey says, If Miss Hale can't tell under what act she claims immunity she hasn't the judgment to be a school teacher. (Applause). Mr. Allen: I regard that as a most ungracious remark. I hope they did not think they were coming here for a lynching. Both remarks are stricken from the record. ;We would like to point out at this time that we are fully aware of the protection given by General Laws, Chapter 71 Section 30 to political opinions and affiliations. We do not believe that this statute protects affiliations with a conspiracy which masquerades as a political party. We consider the Communist Party to be such a conspiracy. Therefore, questions may properly be asked regarding affiliations with it. Despite our views of Chapter 71, section 39, in reaching the conclusions stated below we have not taken into consideration Miss Hale's refusal to answer questions. It is interesting to note the difference between this statement and Miss Hale's belief in the principle that no one should lose his job on account of his political convictions. The majority came to the conclusion that, regarding two of the counts under the 1st charge, she was in fact lying. 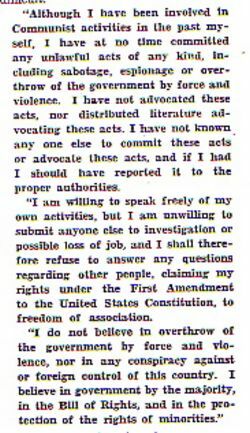 We cannot believe that Miss Hale, in her twelve years of activity in the Communist Party did not learn this doctrine, or hear it advocated, or know of the distribution of literature advocating it. Her experience was too long, her activities too varied, her acquaintances too wide spread, her study of doctrine too extensive, to permit us to reach such a conclusion. We conclude that she did not tell the truth on April 23, that she did so in order to defend the Communist Party, that charge 1 (c) is substantiated, and that she should therefore be dismissed. Without reviewing the evidence at this time, we believe it sufficient to say that even the most charitable view of this case shows that Miss Hale has demonstrated an almost complete lack of perception, understanding and judgment. They also justify dismissal under the charge that following communist doctrine impairs the ability to teach. They speak of the impressionability of second grade, their inability to judge and reject ideas. The dissenting voice can be heard as pained and perplexed. In the writing of Walter Waldron one can see a tremendous struggle. On one side he was suspicious of the testimony Miss Hale gave on April 23rd and he has doubts about her honesty. He found her political convictions abhorrent and recognized that the publicity had done irreparable damage to her reputation with the parents. He felt that he had no reason to believe that her opinions of the Communist doctrine had changed in the least since 1950. His colleagues wrote of substantiated evidence with steadfast certainty. He wrote of the possibility that his decision is less realistic than the majority's. The dilemma was complicated by the impossibility of pulling facts from a silent response. His dissent began with a lengthy introduction in which he lamented her refusal of the questions asked. He admitted that if he were allowed to hold her silence against her he would not have differed with his colleagues. But the fact that her guilt was not proven would not allow Mr. Waldron to vote for dismissal. I realize too that as a member of the School Committee I have a duty to do all I can to promote the interests of our School Department. However, whereas here Miss Hale's record as a teacher has been good, I believe that I may have a higher duty- particularly as a lawyer trained to the legal significance of the principles and traditions embodied in the Declaration of Rights of our Massachusetts Constitution and the Bill of Rights of our Federal Constitution. And that duty is to uphold the right of all citizens including teachers to freedom of belief and lawful association in their private lives. He called this one of the most difficult decisions in his life. This was not a popular response; he was never reelected. Public discussion of Anne Hale dissipated quickly after her dismissal. For Wayland residents life went on, but Miss Hale had a harder time moving forward. She was a lonely woman and never got married. She dabbled in other professions, but again, employment was difficult for a known subversive. She tried to start a small summer program in Wayland for kids from Boston. She got a job cleaning cages, but was fired when her communist past resurfaced. 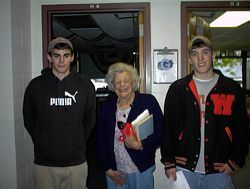 Near the end of her life she taught children with brain damage. She was never allowed to again contribute to the town of Wayland; she never got back to the years which she said were the "happiest and most rewarding years of my life so far." Wilson: So what do you want to know? Wilson: The fact I am giving you these pages is because they devote one-two sentences to the school committee members who voted on Anne Hale's dismissal who held the hearing devoted only two sentences in their report to the town of that event. Barnett: Yeah and there was very little written about her. Wilson: And there was hysteria in some parts of the country but Massachusetts being Massachusetts treated this very lightly, although there were some people in town who thought there was a communist behind every tree. Barnett: Yeah, we actually read something at the historical society were there is this story of people who took there shutters down and um some neighbor told the FBI because um two neighbors and uh they thought it some weird signal the commies had. Wilson: She was teaching second grade, well, that caused a lot of people to say what could she possibly be doing that bother people in the second grade? If she had been a high school teacher, there might have been more concern, if she been teaching social studies there might have been reason to say "y'know she's trying to teach the kids something that is wrong"
Wilson: World War II, and the Russians getting the atom bomb that people got itchy. Barnett: Yeah, um, so that was sorta the, ah, climate of the town, it was sorta, ah, anti-Red and anti-subversive but there wasn't this hysteria. Sanchez: They, um, testified on her behalf or against her? Wilson: They just asked questions anything she had been a member of, because she had said at one time that she was using membership in organizations to promote her ideals. Her ideas, she said, were um, goodness and light and wonderful things, but it could be interpreted that her ideals came from her membership in the communist party. And those ideals would've been translated into we're gonna fight America. Wilson: Overthrow the government. Uh, that hysteria was more...it was brought about largely because of the aggressive action of some people national congress, senate and this general feeling that we couldn't trust the communists because Russia was no longer a trustworthy ally, it was an emend. And anyone who had been a communist, or who had been a fascist, or who had been anything else practically, might want to overthrow the United States government, and somehow we all had to be very scared. Wilson: It wasn't, it was like a minor hysteria. Wilson: That's an overestimation I was there, there was no 700 people, we didn't have a place that would hold 700 people. Barnett: I think we got it from, um, Maynard. Wilson: 700, are you sure? Barnett: What would your estimate be? Wilson: We didn't have the field house, we didn't have the field house, we didn't have anyplace that would hold that many people, it is in the now town administration building, which was then the high school, and had the gym room which is were it was held and that is still...it is the large hearing room now, it is no longer a gym. And it wouldn't hold 700 people, I would say the most it could've been was 500, I think it was more like 300 people, but I am just judging from my memory and I can't... well, check it out, if it is 700, whatever he said he researched. It was a lot less the next nigh, and less then that the next. Wilson: Well, I'm not sure how deliberate it was, um...he had to do this job because he was town council, he knew Anne Hale he knew her personally, and wasn't upset by her and knew what he had to do, and I though did it very thoughtfully, it was more dramatic than I think he expected it to be just because of the situation but he no matter how he tried he couldn't have made it boring to people really interested, but she would say that now looking back on it I am sure. I know Edith well, and she is a wonderful woman and as a matter of fact after each of these sessions they would come back to our house and rehash everything and talk it over so we heard a lot from Roger himself. I think he was deliberately low key so people would not get aroused I don't he had in m,ind keeping away by being boring, but that what he thinks of now, or maybe he told her that and didn't tell the rest of us. Who knows? Barnett: Oh yes, Mr. Gavin! Barnett: You should've seen him! Sanchez: He got down, so to speak. Barnett: Yeah, what was your impression of them? Wilson: Well, I was just about to tell you about Anne Hale. She was a kind of doughty person, she wasn't sharp like your dance teacher, that's why I said sorta school teacher-y, just an image of kinda short and a little, y'know, not very shapely, and just a kinda cute little thing. But she wasn't, she didn't give me the impression of being firebrand or anything like that. The school committee, well two of them were fairly elderly compared with the rest of the population that was attending this and one was a young, in those days, young labor lawyer and he was really kind of an exciting personality, he didn't look it. He was a big tall langely y'know, and, but he was kinda...he was really...actually he voted against her being fired even though he recognized the seriousness of signing something and telling a lie on paper and afterwards in person but she did admit that she had been a member of the communist party, but no longer was. That's the part a lot of people weren't willing to believe. But the technicality on her being fired was the fact that not telling the truth at the time of her application and repeatedly when signing tenure papers and so forth. She never admitted to her membership, her prior membership; whether she was still a member or not I don't think was ever proved, and I don't know how you prove if you're still a member of something that is clandestine as that. Barnett: Right. But, uh, yeah, back to Stokey, what was he like? Wilson: Tall, upright, salute the flag, I mean he was really one of those people but he was very good. Um, most of the other people were people who have known Anne Hale as a schoolteacher, some of the schoolteachers spoke in her favor, some spoke that they weren't sure what they would've done. Not a long list of witnesses, the most exciting thing of course was getting the FBI involved. Wilson: And a lot of things were read into the record, um, the report of the legislative commission that had named her as a communist. But it was more perfunctory than dramatic. It was really not all that interesting. Sanchez: Or reading of some paper? Wilson: I think that, I think most people felt that it was well that this had been handled the way it was. Most, there was certainly not much comment after this, as you know from looking at the Criers. It didn't go on and on like some continuing story. Everyone just sorta picked up their business, and that was it. Sanchez: Could they be changing their drapes? Barnett: Painting the house red? Barnett: So you sorta gave him feedback? Wilson: So we were able to say, y'know, tomorrow night or maybe the next night you ought to ask this question or...that kinda thing. That give and take. The...I think that what everyone was trying to do, who was involved, including the school committee, was to have a fair open hearing at her request. They really didn't want to have an open hearing; they really wanted it to be just "goodbye Ms. Hale, it's been nice knowing you" but she insisted on having this because I think that she felt that if she could prove to them and the public that her prior membership to the party did not affect her teaching. And I am sure she made that clear. And for that reason and nothing else she felt vindicated, even though she was fired. Wilson: Was a bad man in my opinion. And they did a lot of damage to people's reputations. A lot of good actors and public people got vilified that shouldn't have been. And it was not an unpopular thing to be a socialist. Wilson: ... Socialist and communist it's not...It's extreme in those in the mind of those who know but in the general public that's bad. Sanchez: How much did the people in Wayland know about communism, or the ideals...I mean that she published the ideals that she stood for and tried to instill in her students, but you have to wonder how much the people of Wayland actually knew? Wilson: I don't think that very many people did because it wasn't the fashion in those days to, um, devour Marx. Sanchez: Fought the good fight. Wilson: Well, it was certainly...it was certainly nicely done, as I way of saying that I think that Anne Hale's point in having the open hearing was vindicated. Everybody could understand who listened and paid attention that she was trying to prove that a point and she was able to do that. But she could not erase the fact that she had been dishonest with the school committee, and they couldn't erase the fact that she had signed these papers. I don't know what went through the minds of the school committee members themselves, except for Walter because I didn't know the other two well enough to...yes? Barnett: No, just, no, well Walter, what was he thinking? Barnett: That, um, if she, if he had been able to count the silence that she said against her, he would've voted guilty? Wilson: Yes, that's right. He did, he did say that...but reluctantly...um, he wasn't reelected to the school committee, and that may have had something to do with it. Barnett: So, do you think there was a real, uh, kinda...not McCarthyism, but a McCarthyist attitude? Wilson: We were, y'know, anyone young coming into a community is gonna be radical, just by virtue of being young. Wilson: And I wasn't gonna go around talking about pretend communists behind trees so therefore I might be doing some evil too. But not just myself, a general feeling that anybody who had fresh or different ideas might be dangerous; there was the little atmosphere because of the McCarthy stuff that had permeated, so that people...even if they didn't want to, might label somebody a...."Oh, he's probably a communist"
Sanchez: Do you think people did that out of protection, that, "oh, they might think that I am, y'know, up to something, or am a pinko"? Wilson: That's a very clever analysis. Yes, probably some of it was. If I say something like that then people will know that I'm not a...yeah, there was probably a little of that kinda stuff: maybe almost subconscious. That's...that's very searching. Wilson: And that was Roger Stokey, he, and the school committee themselves, and the tenure of the town because even though there were some people who were. Wilson: Part of this is just because of the year, the time or because..
Barnett: What was the '50's like? Wilson: Campfire girls, and things like that were big groups of people and much more than they are now. Wilson: But until the new high school, then new, now the almost 50-year-old high school, was built, high school activity was minimal, I mean there really wasn't a lot of after school stuff to do. The bandleader that came about around then, he really charged things up and got people interested in music. But it...it was a slow process, I mean it seems so to us who want everything now. I think that was probably the thing, when you're growing, when your town is growing, there is an excitement about it that you don't feel now...there...young parents who were really excited about things, they went to everything, babysitting was something that was done all the time, high school girls babysat nightly. Sanchez: I'm sure...I'm sure that's a way that every family got to know every other family, just by babysitting each other's kids, y'know...y'know? Barnett: Was it, wait, was it a close-knit community at this time? Sanchez: What do you mean by "they tried"? Wilson: Well...they...[Side A of the tape runs out] [Side B starts, small elapse of time] involvement, but then there were too many new younger people that they got swamped. Wilson: And so, pretty much things ran the way people with young children, in public schools, wanted them to run. We got an expensive superintendent, we got an expensive new high school, we got three elementary schools, all brand new practically, and they really couldn't do anything about it. Barnett: They were the loudest? Wilson: It is hard to give up a feeling of ownership, when you feel you're an active old timer in town and really run things, and then you begin to find all these thirty year old people are running things, then suddenly you just feel left out, as if...and you're resentful. I think some of that happened, not a lot of it. So, it was more exciting I think for people living here then because, well, I can't say that because I don't really know, but it seems to me, that when, um, I think that the young mothers in town exerted a lot more influence then they do now, in proportion to the population. Because they were actively involved everyday in the town, there wasn't any kindergarten, so they had to take their children to private kindergarten, kindergarten that was absorbed, but at the time we are talking about, it wasn't public kindergarten. And then they got into carpool kinda thing, and there were all these activities that came after school, and so the mothers were driving people that...children, all over town and there was a lot of give and take, um, again as I say there wasn't the organized clubs at school, or music lessons, so that the people weren't involving their kids in that sorta thing. Probably no more quote "together" time than you have now, because of the various kinds of, almost frenzied activities that these mothers were doing rather than going to work someplace and getting paid for it. Wilson: But I think that...that...poor Anne Hale never, of course went on to have a miserable afterlife, she never as able to get the kinda job she had here that was...as good as this. And she kinda...um, y'know, didn't have a rosy after-Wayland life. Sanchez: Did she keep in contact with Wayland at all? Sanchez: Up to no good! Wilson: And that...that took a while. Um, when you elect somebody to a public office, they are gonna last up their term, and there is nothing you can do about it. Sanchez: Did you know anyone or did...yeah, did you know anyone who was really just adamant about McCarthy, just loved him, just thought he was doing such a good job...? Barnett: Sorta just washed away? Barnett: I'm sure they had their own communists! Wilson: Yes, they had their own communists! You're right, and they had other things which were happening, so, um, y'know, it was...everybody in the country was concerned about red China, communist Russia and of course there was the whole USSR, so it wasn't just Russia. And what was left of...of...y'know...un...un, the people who hadn't quite been quelled of their fascist notions in Italy and Germany. People were much more concerned with idealist...different kinds of idealism in other big foreign places, so that gradually, I think most of the country began to realize that this country was not about to be overtaken by a few Gregory Pecks or whomever...[laughs]...it just wasn't going to succumb to some foreign idealism that wasn't proper for this kind of a set up, with, a democracy isn't just gonna give in to a few people who want to change things that much. And so they relaxed a bit. Okay? Barnett: Yeah, why thank you! a Wayland resident who knew Ann Hale. Sanchez: Did you know anything about Ms Hale before the Trials began? Mrs. Kingsbury: Oh yes my son had her as a teacher. Shaw: Oh thats so interesting. Sanchez: [At the same time]Oh really? Sanchez: Do you remember any of her classroom antics or anything along those lines by any chance? Mrs. Kingsbury: She was a very good teacher. one of my sons had her. I guess it was Keith, the oldest son. I have three sons. And I went down and helped her in the classroom as a mother helper. Sanchez: So you got to work along side her? Mrs. Kingsbury: Yeah, I didnt go very often. It was when she had something special she wanted to do with the children. [chuckles] The one thing I did was arm wrestling. Mrs. Kingsbury: Hm, something like that. 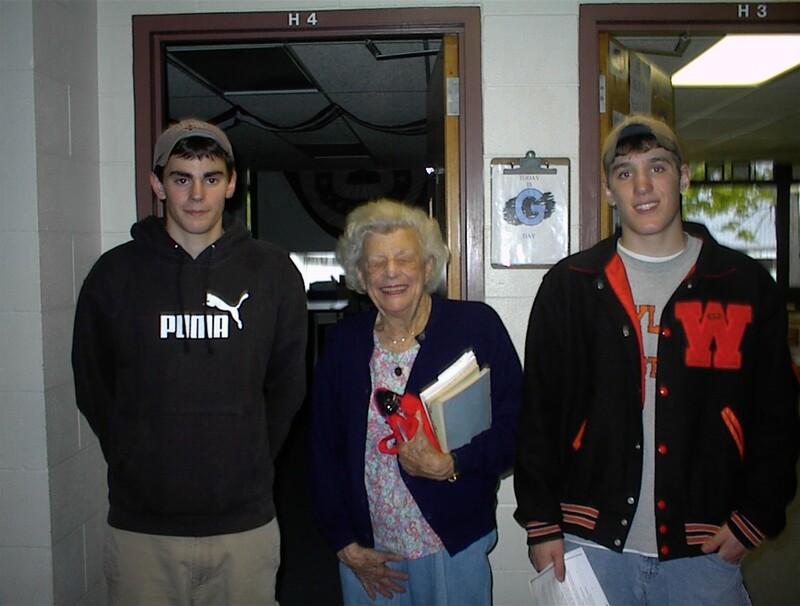 Mrs. Kingsbury: Well, I think they were worried about the communist group that she seemed to be unaware of it being they were friendly to her and she was shy and so they became her friends and there was something else that was brought in by this group. And thats why she got a bad name. It was too bad she was a nice person. Sanchez: What she got involved in or how it got out? Mrs. Kingsbury: I dont know. As I remember she just seemed to be in that group. I think she just didntÖ She was really unaware of... that it was wrong, that group of friends. She didnt probably defend herself. Mrs. Kingsbury: Or maybe even understand. Sanchez: Do you know any of those friends? Do you remember anything about them? Mrs. Kingsbury: No No I knew nothing about them. It wasnt until she was- oh the start of the trial wasnt it. I think my brother was one of the lawyers, and Mr. Stokey. They worked together. Mrs. Kingsbury: Now theres a paper that was written by a member of the Unitarian Church that describes the whole thing very very well. Mrs. Kingsbury: Oh yeah hes the one who wrote it, absolutely. Mrs. Kingsbury: That right, they did. Thats about the time I joined. Sanchez: They gave people the impression of? Mrs. Kingsbury: Yeah yeah of being liberal. This town was not a liberal town. Shaw: Out of the loop? Mrs. Kingsbury: Yeah. Pointed at. Sanchez: Really? Anything that had to do with just human rights? Mrs. Kingsbury: Not just- well no I think thats just the way I looked at it. Because some of my good friends were people who were involved in something called Fair Housing. Sanchez: Yeah Fair Housing: it was so they couldnt discriminate against people trying to buy a house. Mrs. Kingsbury: Yup. Now thats good thinking. Sanchez: And those people were pointed out or singled out? Mrs. Kingsbury: Some of them. Some of them. It was a pretty conservative town. Shaw: Thats funny how Wayland's become so, I mean for the most part, liberal now. Sanchez: What was it that drew you to join the Unitarian Church? Mrs. Kingsbury: Well I think the Reverend Daniel Finn was at the Unitarian Church. I started out at the Congregational Church because the home which I came from the Congregational Church is the one I went to. So when I came to town and put Keith in the Congregational Church he was quite shy. At the end of the year I received a letter from the church saying theyre sorry that my son had not attended and hoped that he would return in the fallÖ and may god be with you or something like that. We though [chuckling] hed get a gold pin for attendance. So thats how much they paid attention to the school board he was very shy. So I learned about the Junior Church at the Unitarian Church which seemed to have a wonderful- Dan Finn is a wonderful preacher. He and his wife organized the Junior Church so that the older children would set up an organization just like the senior church. And teach them to be responsible and that sort of thing. It just seemed like a program that made more sense to my husband and me for him. And then I enjoyed it too. Sanchez: Did Ms. Hale recognize that your son was a little bit shy; was this something she pointed out to you? Mrs. Kingsbury: Of course, she was veryÖ He was young, actually. His birthdays in November and he was really shy. We felt he was ready; he was beginning to read and we were not at that timeÖ we were anxious to get him into school. Thinking it was the thing to do. We thought we were doing the right thing. Actually we should have brought him to a private kindergarten. Sanchez: Why do you say that? Mrs. Kingsbury: Because he was young and immature and shy. And now a days they dont start children, nevermind the age, you go when youre socially ready. I taught kindergarten for a long time and selected children from nursery school to go into kindergarten when they were ready. Mrs. Kingsbury: He loved her. Yeah, she was very very nice. Shaw: She wasn't impatient or anything? Mrs. Kingsbury: Oh no. not impatient. She was just a lovely person with children. As far as we could see. Mrs. Kingsbury: I've never heard of anybody, in fact it was just that year that anyone had any problems. Sanchez: Were you caught by surprise when... how did you find out that she would be put on trial? Mrs. Kingsbury: Oh it built up. My brother was involved and some people were complaining because she was involved in this group. And felt that she was not suitable to teach. The whole thing to me seemed quite unfair. Sanchez: You say there were people that complained, like they were a group of very vocal citizens? Mrs. Kingsbury: I gather so. You know I was unaware of that because everything was so successful: With the children and the nursery school and kindergarten they were in. Finally I was on the board of the Junior Town House for kindergarten. Once your child goes beyond kindergarten you cant be on the board, school board. So I was just a mother at home until- lets see why did... oh I know, one of the teachers died- and I had a teachers certificate so they asked me to teach. I've been teaching ever since, until I retired. I actually have a therapeutic dieticians degree. I went to college and then graduate school. Mrs. Kingsbury: But I had three little boys and I wanted to stay home with them and I thought well I like children so I'm going to go on and do this. Sanchez: There weren't a lot of women, er, mothers that had jobs at that point? Mrs. Kingsbury: No not like that. Shaw: But teaching was a common job for women. Mrs. Kingsbury: Yeah. It was just being involved, it was something that I was able to do and to do it for the children. Sanchez: Did you ever get to see any of the trials when Ms. Hale was put on trial? Mrs. Kingsbury: You mean went to the meetings? Sure. My brother was part of the scene. Sanchez: Can you describe those? Mrs. Kingsbury: Uh well it was just questions and answers and it was held at the High School- old High School Gym which is now the town building. We all sat on the bleachers and there was a moderator. I think Roger Stokey might have been the moderator. Sanchez: What was the atmosphere like? Was it exciting? Sanchez: Did people come to the meetings with very strong opinions about her? Mrs. Kingsbury: I suppose some did. I think most of my friends certainly thought it was unfair. That it was too bad it was happening in a small town. Sanchez: Do you remember anyone who was just adamantly against her? Mrs. Kingsbury: No I dont. I think there were some people who might have been... no, I dont know anyone who was adamantly against her. I think there were people who felt that she was being unfairly criticized. Probably because she was so nice and got along so well. I mean we have three little boys and were interested in doing the right thing by schools and kindergartens an ooh. There were a lot of stay at home mothers. It was a while when I was well into teaching there were a lot of divorces in town. The town had grown, there were divorces. Mothers were working, and thats when I did most of my teaching in the public school system. That was some of the problems there, well after I got involved in the junior town house. As the town grows different problems come up. They're handled differently. The staffs change. Sanchez: Have they changed for the better in your opinion? Mrs. Kingsbury: Oh Yes. The school system was really very good and it still is. But we worked hard for it.